I have heard that a bra that is not properly installed can flap in the wind when being towed. It then can wear the car's paint down leaving marks on the car. I also heard that the cotton backing if left on the car when wet can mildew and hurt the paint. These two reasons have kept me from using one. 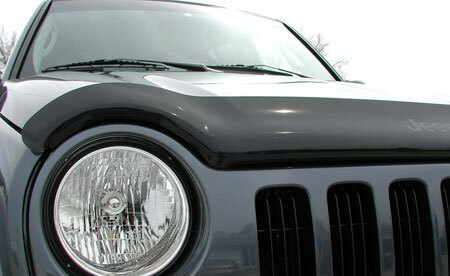 I have not had any problems with paint chip while towing our Jeep Liberty for the last ten years. I have had black vinyl bras on my Corvettes and never had any such damage. But like Tom says, if not properly installed or left on indefinitely, they can do harm to paint. Just be sure it's on tightly and take it off when your trip is over. On our MR2 Spyder, the entire front was painted, so a full covering vinyl bra would have done good. Our current tow vehicle a 2006 Liberty, it has a raw plastic bumper so it is less concerning. It's painted grille seems to be doing well, no rock chips at all after a number of towing trips. My wife loves the Groucho Marx hood deflector/protector. Personally, I despise it, but it's her daily driver. Here is a pic of the same hood protector my wife's Liberty has....Hi Groucho! If my wife ever put one of those on her Liberty, I would have to think about putting a paper bag over my head when in her car. Now you've got me thinking. I guess I didn't explain myself? I was asking about the rock guard that goes on the back of the MH, like a big long mudflap. Ah! Sorry, I have no experience with that one. I did wonder if they did that much better than the nice mudflaps we all already have. I suppose more is better. I do get dust-like sand and such debris that accumulates by the wiper blades of the tow vehicle. But I figured it was coming from around the sides of the PC, not from the rear PC tires. Maybe I am wrong. Those long mud flaps have a tendency to drag when exiting gas stations and over bumps. When they drag they throw small rocks at your toed. The grass ones sail back at high speed and do nothing for you. I had one on my class A. Save yor money for better things. I have a Protect-a-Tow that works well. Fits under the hitch from the PC to the Honda. Costs about $220.00, but it is easy to use. Here is a link. A little late replying. Spent summer towing honda crv behind pc2350. Had blue ox Trac bars and safety steer installed. Still had quite a bit of pull from wind and passing trucks. Also has brake buddy. Hate the fact that you are very aware every time you apply brakes particularly quickly. When I got home I traded my 2014 crv for 2013 honda fit. Had a stealth brake system installed. Between the smaller car and new brake system towing was a pleasure. It was worth it.don't forget honda made after 2013 are not flat towable! !